• Chocolate Cake with Peanut Butter Icing. • Assorted Cookies like Chocolate Chip, Oatmeal, etc. • Cakes for your Birthday, Anniversary, Shower, and Wedding Freshly Made and Decorated by Our In-Store Baker. Why settle for store-bought when you can pamper yourself with in store made bakery products from right here in your hometown? From your first mouth-watering bite into one of our sticky buns or creamy peanut rolls, you’ll understand what people from as far away as Reading and Harrisburg are raving about. You think peanut butter and chocolate is a good combination? Wait until you try our chocolate cake with peanut butter icing. It is a delectable treat you cannot find anywhere else. Want to support local farmers? 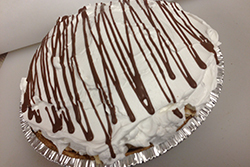 Our pies feature apples, peaches, strawberries and cherries grown in and around Schuylkill County. 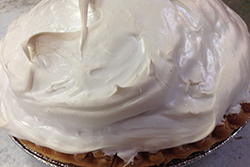 The ingredients in our pies go straight from the farm to our oven to your table. Sometimes, you just can’t any better than that. It’s true that nothing beats in store made. Find out why and place your order or visit our bakery today.